In June, 2008, the last property of my family’s 65 year old farm in Jacksonville was sold. I photographed what remained on the property to record our family legacy. These images tell a story of an immigrant family’s success in America, and contains an emotional expression of personal memories and reconciliations of the past. The completion of this project enables me to provide closure to the accomplishments of a courageous family with a proper recognition and record for future generations to discover. As a native and resident of Jacksonville, I am impressed with the diversity of people and places in and around the area. An unlikely attribute of the city is its notoriety as a leading producer of Chinese produce in the 1950s-1970s. The Wing Lee Yuen Truck Farm on Imeson Road was started by 3 brothers, one of whom was my grandfather, Jung Fie Ng. At one time the farm encompassed over 300 acres and on June 18, 2008, the last property of the family farm was sold for industrial development. It was the end of an era and a time to be soon forgotten. In September 2007, I photographed the barn and adjacent properties. The project began almost by accident, when at the insistence of my wife Dorian, I reluctantly called my Uncle Chan to ask if all the big tractors were sold. I knew that the farm was for sale but did not know any of the details. I had not returned to the farm since my father passed away in 1993. My Uncle Chan told me that only one big tractor was left, and that I’d better get out there soon because many of the relatives had already taken things out of the barn. I arrived the next morning. These photographs tell a story of hardship and success of an immigrant family in America. This is a story of my own beginnings and many childhood memories. The symbolic “barn” is the main subject of my investigation. I let the barn speak though my images about the workings of the farm. A simple but imposing structure, the barn housed the equipment, the workshops, the storage, and the shipping areas for production of all the produce. For decades, thousands of crates of vegetables would be either trucked, railed, or flown daily out of Jacksonville to supply hundreds of grocery stores and restaurants across the eastern US and Canada. The adjacent property contained several houses and storage sheds. The primary residencies of my grandfather and his brothers consisted of 3 brick ranch-style homes facing Imeson Road. 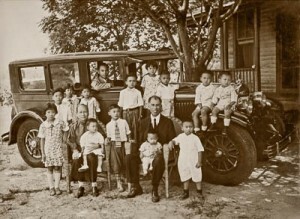 My father had 12 brothers and sisters. His uncles also had large families. I remember that my grandfather prided himself on his immaculate lawn and flowerbeds, always full of blooming plants. He had a big, white Chrysler Imperial parked in the garage, which was only used for weekly trips to church and the grocery store. My record of the Wing Lee Yuen Truck Farm documents the accomplishments of my family and conveys the emotional experience I had during the photography. I knew the scenes would be destroyed and lost forever, with my images being the only remaining visual record of the farm. Certainly an important part of the cultural history of our nation and an important personal record for my aunts, uncles, and many cousins whose lives the farm touched. I believe we all need to explore our origins to ground our presence and perhaps answer those personal questions about meaning in our lives. In retrospect, I wish I had been more thorough with my study, but I captured what caught my eye at the time. The images sat for a while and in 2010, I applied for and received an Art Ventures grant from the Community Foundation of Jacksonville to produce an exhibit of the photographs at my studio downtown. In the winter of 2011, On Fertile Ground was shown to a small audience during the PhotoJax Photography Festival, and then I put things away. In early 2014 film maker Clif Brewer, offered to make a video and I decided to open the project again. With the completion of the Artist Statement video I was inspired to do another iteration of the exhibit. I was fortunate to have an exhibit scheduled at the Lufrano Intercultural Gallery at the University of North Florida for the late summer of 2014 (with much gratitude to Paul Ladnier, Professor Emeritus of the University). I actually changed my original proposal to accommodate this new iteration. I’m grateful that the gallery directors were so flexible to my request. I embarked on a completely new edit and rework of all the digital negatives. Every image was reexamined, reprocessed, and reprinted to reflect my current capabilities and artistic intent. As I worked through the images again and shared them with others, I realized how important it is to understand our past. I am fortunate to have photography as an expressive medium and hope that this exercise can inspire others to connect with and celebrate their past. As long as I can remember we visited the family farm once a month. It was a long drive across town, down a dirt road, to three brick houses situated in the middle of nowhere, a bit of civilization in what seemed to be fields that went on forever. Those days are long past, the houses recently abandoned, and the last of the land up for sale to make way for warehouses. As I drove up to the farm on a hot August morning the fog was covering the roads and fields. My Uncle Chan was leaving for an early errand and I was left on the property, completely alone, with my camera and a lifetime of memories. I had not returned here since my father died 14 years ago but nothing had changed. As I walked around the big barn I began to see and notice what I had never realized in all my times here. The smells, the sounds, and the nostalgic feelings were all there, but the details of hundreds of still lifes unfolded around me. Each square foot of the barn was filled with actions frozen in time. A hammer left on a tiller, gloves on a spool of wire, a chain hanging from the rafters used to pull an engine, ropes and wires hanging on nails, the scale which weighed out countless boxes of Chinese produce which at one time were shipped out as far as Michigan and New York. All of these scenes were frozen in time, the dust settled over them, but the life in their arrangements only temporarily arrested. I knew that it was my time to record these moments with my camera, for in a matter of weeks all of this would be gone, destroyed, and never to appear again. As an animal or plant goes into extinction, so too do these articles of a past time and life. My record would be the only one for the future should anyone want to know what it was like in the barn of the Wing Lee Yuen Truck Farm. I wish to thank the Community Foundation for Northeast Florida for their generous support of this project. The Community Foundation has supported individual artists in Jacksonville for two decades through their Art Ventures initiative. I would also like to thank the University of North Florida for hosting this exhibit in the Lufrano Intercultural Gallery. It is an honor to have the support of the university and the community.